This week we are in our main bathrooms! Do you have a bathroom that does not make you smile? We are going to accentuate the positive and eliminate the negative (clutter). We can help you make the most of those out of style colors. Even Robin Egg blue looks good when it is clean! Let’s start by getting rid of the clutter! Let’s do a 27 Fling Boogie in your bathroom. Here are some items to start flinging out of this room. Get out your Declutter Kit. Give away, Put away and Throw away. 8. Wipe the shower rod or top of doors. Next we are going to take your clean bathroom and play! 5. Hang up your hand drying towel. Some members use our days of the week dishtowels. 7. Do you have some curtains that you can hang and pull back. 9. Stand back and take a look at your masterpiece! 11. Take a picture and send it to me! by replying to this email! See how easy this is if you will accentuate the positive and eliminate the clutter. You are going to love your brand new Bathroom. Now keep it clean and shining by Swishing and Swiping every day. It only take a minute to shine it when you have your Swish and Swipe tools in your bathroom. 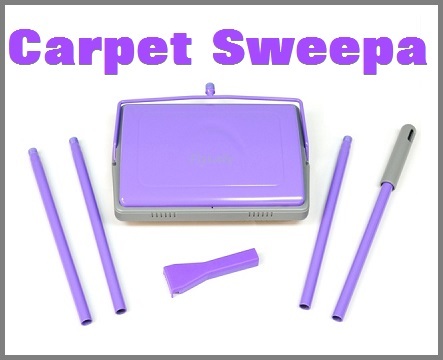 The Carpet Sweepa is a great way to get your throw rugs clean. Thank you all for your rave reviews! Hi FlyLady. I’ve been following you since 1999 All I can say is that life is a process. My DH loves books, so that is my next venture for decluttering. Do you have the litmus test for getting rid of books? This is going to be very difficult. Also, I want to say that I bought the Carpet Sweeper and absolutely love it. Now when something drops on the rug under the dining table, my husband can’t wait to get out the Carpet Sweeper and clean up. He had been using a vac for this but I told him food shouldn’t be vacuumed since it can get “nasty” on the rotary brushes and rot in the bag. YUCK! In with the carpet sweeper – problem solved! Even though I’ve been following you all these years, I still have problems with letting go – but it’s getting better each day. I especially like that this month’s habit is to declutter for 15 minutes a day. I had stopped decluttering and lost sight that the clutter was coming back! What can I say? Thanks for all you do to help us FlyBabies focus. And like I said earlier, it’s a process. This entry was posted in Morning Musing and tagged bathroom, flylady, get organized, make-over, play. Bookmark the permalink.